On-site course: Aggarwal, No MAS. Disclosure. October is the month of Our Lady and also celebration of two years of Easter Claudio Pastro, († October 19, 2016). 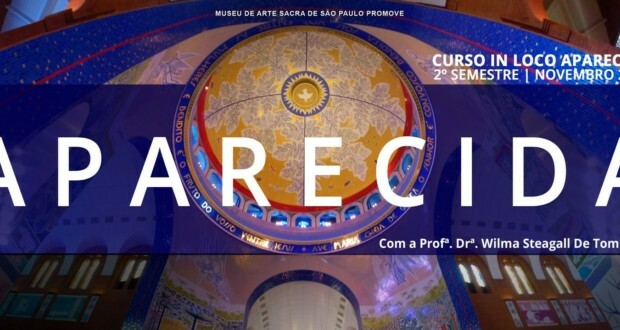 Claudio is largely responsible for the decoration of the interior space of the National Shrine of Aparecida, the biggest Marian shrine of the world. 1) Mini-gym: On this visit we will start by "fishing" of the Virgin by three fishermen in Rio in Paraíba 1717 and the development of this fact over time; after about the architecture and construction of the Basilica and its history, Finally a short biography of Claudio Pastro with emphasis on his artistic style and motivation. 2.5 Monument in honor of Our Lady of Aparecida, facsimile opened in the 03 September 2016 no hair Vatican Pope Francisco. 3.4 Walls of the Basilica and its meaning. *Itinerary subject to change due to religious celebrations or public activities that are not informed or planned in advance by its organizers. Wilma Steagall De Tommaso, PhD in religious studies from PUC-SP, Researcher and lecturer of religious art and religion. Profª. invited da PUC-COGEAE, Participates in research group coordinated by Prof. Nemes. Dr. Luiz Felipe Pondé. R$ 196,00 the view or R$ 240,00 (02 times) cash or bank deposit. After sending the voucher your registration will be formalized. – Transport (bus, air conditioning, TV, toilet) that will be available during the trip. – Any transfer of the activities will be done with the Charter bus. - meal expenses, drinks, parking. Address: Avenida Tiradentes, 676, Light. Metro Tiradentes. Certificates will be issued to participants. Important: The complete list of passengers with names and RGs need to be in DNER in advance. Your deposit slip is your proof of registration. In case of cancellation, a job may be replaced by 7 days before the trip.